A full day of bike testing at the Odd Down Cycle Circuit in Bath. Test ride bikes and e-bikes from Giant, Liv, Look, Canyon, Vitus, Raleigh, Haibike, Wisper, Kallhoff, Sven. You can also see the latest from Maxxis, Pirelli and Fizik. 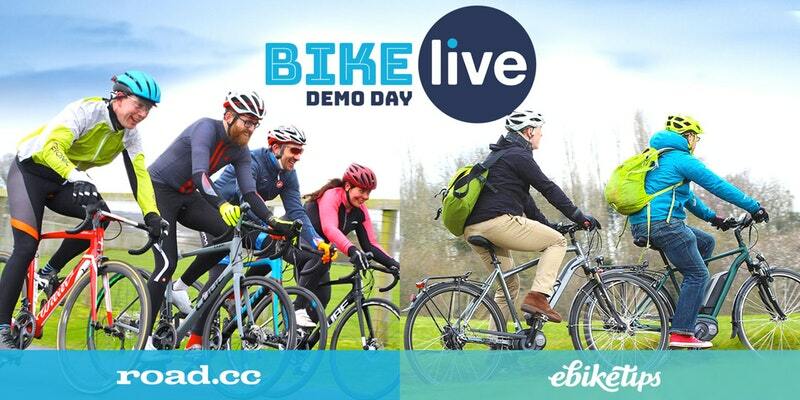 Bike Live Bath has exclusive use of the pristine 1.5km road circuit all day. No fighting with the traffic on your test rides! This event is perfect if are you looking for a new bike or e-bike, or you just want to know what's out there and fancy a day of riding the very best. There will be food and refreshments available all day, so bring your friends and family along to watch. Non riders are free. There's plenty of parking available, we open at 10am, and the day finishes at 5pm. There will be e-MTB rideouts organised and led by Dave Atkinson, editor of ebiketips. Bring a spare set of riding kit if you're planning to try an e-MTB, things tend to get muddy! This event is organised by Farrelly Atkinson, the same people who publish road.cc, off-road.cc and ebiketips. Every ticket comes with a free entry into a Cycle Choice competition, to win a voucher worth £100.